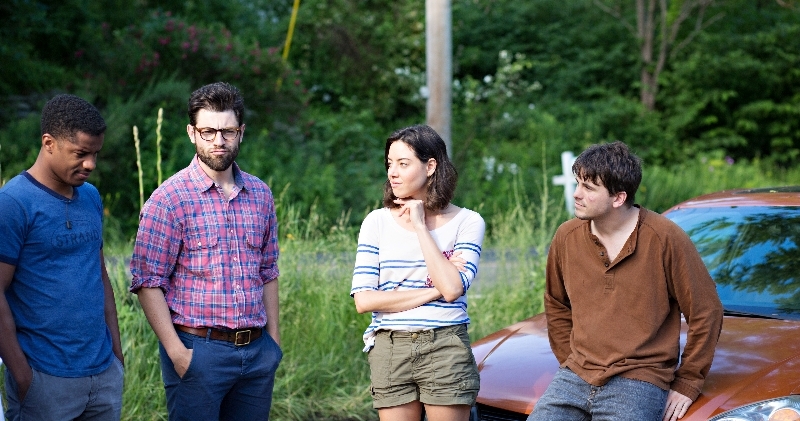 About Alex Review - Indie Effort Revisits The Big Chill - Are You Screening? 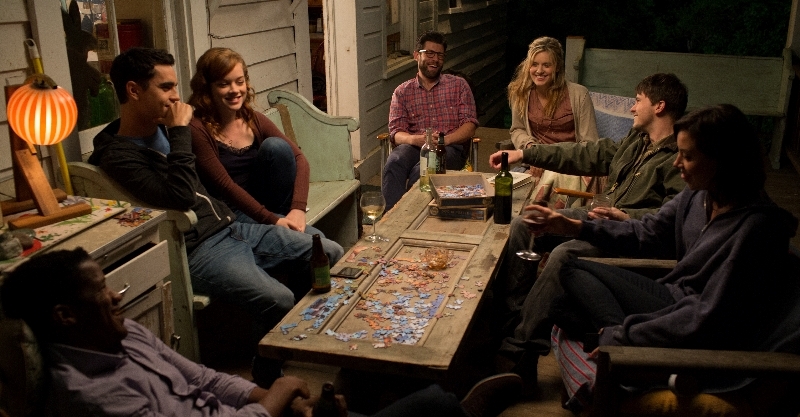 Writer/Director Jesse Zwick’s About Alex involves suicide and a group of friends hanging around a house, so there’s no way to avoid comparisons to The Big Chill, but I’m reminded far more of any number of indie films, especially 2010’s Helena from the Wedding, which doesn’t involve suicide, but focuses on a rather similar group of friends hanging around a house. On the other hand, most everything I would say in reviewing The Big Chill, I would also say about About Alex, and that’s a hell of an endorsement already. Before even getting to the film, there’s a danger with this effort such that audiences may be prone to finding the cast the most interesting thing about it. The titular Alex is played by Jason Ritter, and his college friends who rally around him after he attempts suicide are: Aubrey Plaza, Maggie Grace, Max Greenfield, Nate Parker, and Max Minghella, with Jane Levy coming along for the ride as well. That’s a lot of modern-day hipster weight for an indie film by a writer/director you’ve never heard of, made by a studio without a lot of previous films. Anyone bothering to wonder about such things might raise an eyebrow, and could easily suspect that what you’ve got here is a pack of actors who are becoming fairly popular getting paid to be on vacation together for a few weeks. Tempting as such thoughts may be, reserve a few minutes to consider that what you might have here is a group of actors who could all spend their time getting paid considerably more, who were won over by an interesting script. The story of About Alex, as is the case with any decent conversation film, is only vaguely hinted at by what you see on screen, but is perhaps best summed up as the latest generation’s peculiar form of angst, and the difficulties of moving through it into adulthood. Sure, Alex tried to kill himself, but it’s only relevant to the conversation as a kind of hyperbolic jumping off point that forces the whole group to stare into the abyss. We might just as easily have had one of them get divorced, or lose their job, and fall into a serious depression, but it’s easier to get people on a plane when you try to kill yourself, which is why he did it. Of course, staring into the abyss is not something people do, despite the repeated insistence by Greenfield’s character that this is precisely what we should do. No, what people do is pretend there is no abyss, or see if the abyss needs a bowl of soup, or wonder about the mutual attraction that may be at play between other people, because that’s a nice distraction, or constantly upload photos to Facebook, Twitter, and/or Instagram to document all our experiences, in order to ensure you never actually have any, because… what was I talking about? It may sound depressingly serious, but that isn’t the walk you’re on here. Ben (Parker) and Siri (Grace) are a couple, and Josh (Greenfield) and Sarah (Plaza) used to sleep together, but outwardly seem to hate each other. 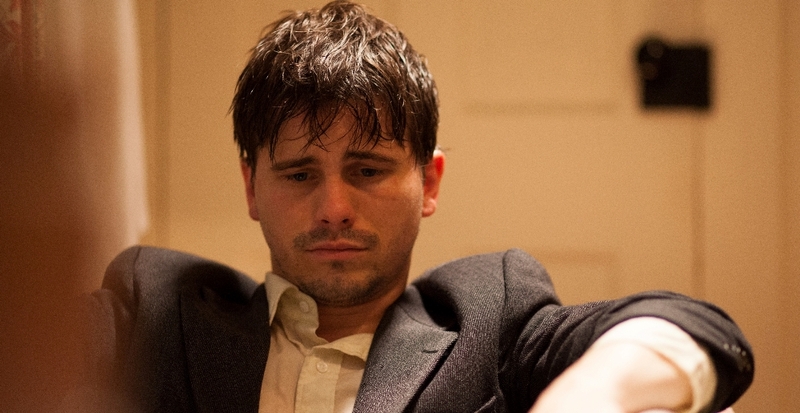 That leaves Isaac (Minghella), who brought his new girlfriend, Kate (Levy). They’ve all dropped everything to show up and make sure that Alex is going to be alright, but they soon realize that none of them know what that means, or what exactly they should be doing during their visit. This leads to the usual kickoff of talking near each other, and vaguely referencing members of the group, but without talking to each other, or about anything. Josh, representing one extreme, wants to ask Alex what the hell his problem is, while Sarah, representing the other, wants to cook and metaphorically fluff Alex’ pillows. As the group settles into continued close proximity, their time apart slowly falls away, and they slip into old habits and attitudes. At times the suicide seems all but forgotten, at others we refocus on the fact that our group doesn’t want to leave Alex alone, as though he might duck into the next room and off himself. As you might expect (because, what would you do? ), the group just reforms itself into the group of friends from college, with Kate (much like the titular Helena mentioned above) serving as the outsider by which we manage not only an unfiltered view of the group, but also get a chance to see what they do with outsiders. Eventually, we start to acknowledge the things that seem to have gone wrong with this generation’s transition into adulthood, and where these difficulties are (or seem) unique, and where they are the same as they are for every generation. It may be that Alex fled to the most grandiose gesture, but they are all swimming in their own uncertainty. Sarah (who works in the legal field, but for the life of me I can’t recall if we are ever given the specifics), hints at the most pure form of the relevant ghosts haunting them all early in the film when she vaguely suggests that it seemed like there would be a magic age when you got your “grown up” card, at which point you would magically feel like you were an adult. As time goes on, it becomes a never-ending cycle of thinking it would happen at 25, 30, etc., and dealing with the big, fat nothing that shows up at that age. There is a way to view About Alex that only acknowledges the superficiality of much that is actually said, and that registers only the actual actions taken by the characters, but it involves a kind of willful ignorance that proves much of the film’s point. This is a generation bombarded with meaningless information, and told that living at a dead sprint is just the best thing ever, but for all the differences that may exist about life now, it has all happened before, and it will all happen again. In 400 B.C., a philosopher complained that this generation’s youth is rebellious and won’t listen to their parents, and in 5,000 years 20-somethings will continue to be surprised that no one seems to want to listen to them. The film ends with a flashback scene of Alex meeting a group that already existed, and though I actually don’t love the scene as a film/script decision, it’s rather brilliant as a closing non-statement. For all the life changes, and screwy focus on Facebook friends as opposed to actually knowing anyone, and self-esteem getting caught up in things we don’t even understand (like Likes and Selfies), when it comes down to it, we are all, at the very heart of things, just some guy who happened to sit somewhere once… and what the hell are we supposed to do with that?